I'm back (after a busy month of no blogging)! And I'm now officially a college graduate! I just graduated last Tuesday morning in the pouring rain... Seriously, it was the only rainy day of the week. What is up with that? Well, at least it was a super memorable experience. Nonetheless, it's big milestones in life, like graduation, that make me realize just how quickly the years pass. 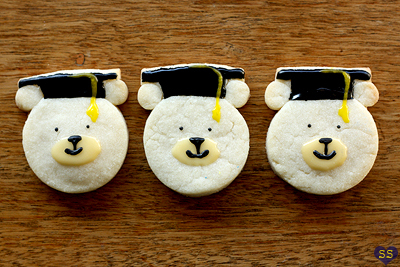 To think, just four years ago I was still in high school with pretty much no idea how to bake. Now, four years later, after teaching myself to bake and realizing how awesome it is, here I am with my own baking blog. It's interesting to see just where life takes us. 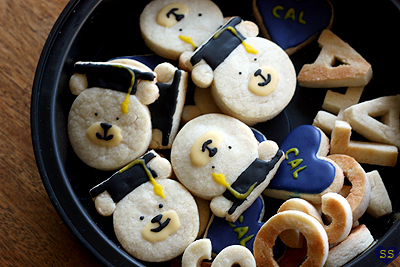 For my graduation, I decided that it'd be nice to bake a bunch of Cal themed cookies to pass out to friends at the reception. The key was that I didn't want the designs to be too complicated, so that it'd be easy to make them in bulk. 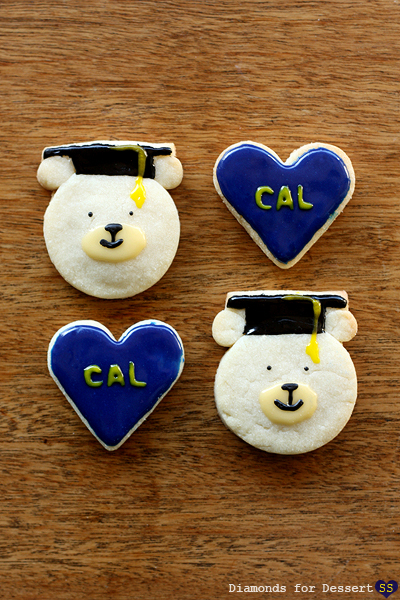 In the end it all worked out, and I ended up with two designs: a blue and yellow Cal heart (much love for Berkeley) and graduation bears (Go Bears! ).